The Dreaded Register | Preventing overdrafts, by actually knowing your balance... the real balance. If you are not one to understand detailed facts let me just head off all I’m about to say with one simple rule to avoid overdrafts for the rest of your life. The bottom line is this: keep a separate written record and don’t spend more than you have. Now for those who need more let’s take a deeper look at that statement. A separate written record is one in which you write everything down from the largest payment to the smallest cup of soda. Using your online banking, as great a tool as it is does not excuse you from keeping a record separate from the bank. You can use paper and pen, or a software program like Quicken, or even build your own excel sheet. If you do use Quicken I don’t advise downloading your history, input all the data manually. Downloading data can make it harder to catch fraudulent transactions. More than one person has called their bank about a small transaction only to find out it’s been coming out for two years or more without their knowledge. However you do it, you must track the transactions going in and out of your account separate from the bank. This is the only way to know for sure that no fraud is going on and find out what your balance is. The bank doesn't know your balance. There are many reasons why your real balance may not be the same as the balance showing online. Online (or at the ATM, 800 Number, or any other bank record) only reflects that which the bank has received not everything you have done. Even card transactions do not always come through right away. This is a humorous but true example of a total lack of understanding how money and math works. This person should not have a bank account, or even handle money. They should have someone take care of things for them. Keeping a record does take work. One of the first things you must understand; just because you deposit a check into the bank doesn’t mean it’s available to use. Checks usually have to post to the account before you can use them. Also, checks may have holds placed on them, or even be returned as no good. If you have any doubt that the check you put in is good, wait a full three weeks before using the funds. That is how long it can take for a bank to find out that the check was no good (Yes even in 2011). That being said the first step, assuming that you start with a zero balance, is to input your deposits. You should not spend what you do not have. What is my ledger balance VS my available balance? When items post the result is a balance of some kind. This is called your “Ledger Balance” also known as your balance as of the last business day. It is the ending balance including everything that has officially posted but not the balance including any pending transactions (those that have not yet posted). Your available balance is the Ledger Balance adding/subtracting anything showing as pending. As we said with checks there are instances where a deposit that is pending is not part of the available balance either. Unless the deposit was electronic it won’t usually be available until it has posted. There are also lots of ways for your card transactions to not always show as pending all the time. Sometimes transactions especially card transactions may double or triple pend, pend for wrong amounts (more or less), pend for several days, then disappear and post at a later date. Therefore always check your balance on a separate written record where you write everything down and add and subtract as you go. Not only is this a good idea, you are required to according to the bank in your disclosures. 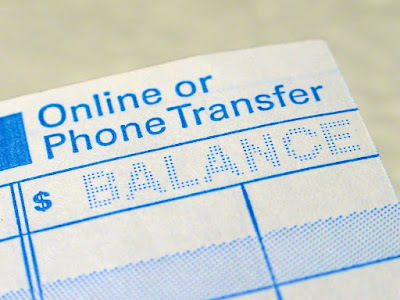 Calling for your balance, going online, ATM, or in any other way contacting your bank for your balance is not a replacement for a written record. If you contact the bank for your balance assume it’s wrong! Always look to your own records for up to date information. If you don’t know your balance without contacting the bank, than no-one does especially the bank. Overdraft fees are awful, high, outrageous, expensive, and… well you get the point. You know they are awful. I once had one item go through my account and cause several items to post into overdraft causing, more items to post into a negative balance and so forth. I paid over $450 just in fees that one month. I don’t know about you, but I didn’t have $450 to spend on fees, so it put me behind months. Do you know who was to blame for that overdraft causing $450 in fees though? The Bank? The President? The Congress? No. It was me. I set up the payment and agreed to have it auto deducted. I failed to account for it in my balancing. I did it, knowing full well the fees that could come if the balance was not there for it when it came. Therefore I am the only person to blame. The sooner you get a hold of that reality the sooner you can take action to prevent another fee on your account. On July 21st of 2010 a banking regulation was signed into law by president Obama. It is called the Dodd-Frank Wall Street Reform and Consumer Protection Act. Immediately following this acts’ passing banks were limited to how many overdraft fees could be charged per day and how they could approve and post items that could cause fees. Each bank drafted new policies around this regulation. Those two changes were only the beginning. As of the beginning of 2011 there are still 900 laws that still haven’t been written from the stipulations of that act. The financial picture is changing. Banks are being restricted and so are the free services. What does this mean to you and your overdrafts? It may be a small bit harder to get a fee, but a great deal harder to ask the bank to reverse it. The only sure fire way to avoid an overdraft fee is… drum roll please… to not overdraw. I know, magic right? Allow me to review accounting 101. Anyone can do this. The correct way to use your account is to make a deposit (or add money) to your account. Then make withdrawals less than or equal to the amount deposited including any fees or charges. So now the balance is $36.50. However in the real world most people don’t do things the way they are supposed to. The banks post items according to regulations. Your bank isn't making these rules, people in the Federal and State Governments are. Even different states may do things differently. Generally what happens is someone gets to the point above and then writes a check on Thursday expecting that the check won’t come through until the direct deposit comes in Friday. Usually this works but since companies have so many convenient electronic ways of clearing checks it could come in on Thursday. Some banks can take your check, and clear your other bank on the same day. So you now understand how this happens. What if you are already in the middle of this? What if you are overdrawn so often you can’t see how to get out of the cycle? What do you do now if you are overdrawn right now? Turn to the next chapter for help.